Find the general region of interest at low magnification; once located increase the magnification. Ensure that you chose an area with suitable thickness. A t/λ thickness map is ideal for this determination. Typical TEM image of BN flakes on a lacy grid. Low magnification to identify ROI (left) and increased magnification to further identify ROI and sample thickness (right). Click on the EELS status text to control the dispersion, aperture and energy offset. You can choose the energy offset by element from the periodic table icon. Note: Generally choose the smallest dispersion (largest eV/ch value) that still gives the required energy resolution. Assume at least 3 channels are needed to define the energy resolution (e.g., 0.5 eV/ch will yield at best 0.5 x 3 = 1.5 eV resolution). For systems with adjustable apertures, choose Hi-SNR (largest aperture) for mapping and general EELS, and choose Hi-Res for low-loss EELS and ELNES studies where the best energy resolution is needed. Select Auto in the Exposure field of the EELS palette to use the auto exposure function. If you prefer manual mode, disable Auto and enter the Exposure time. Alternately, with the live EELS window front most, hitting the up/down arrow keys will double/half the current Exposure time. 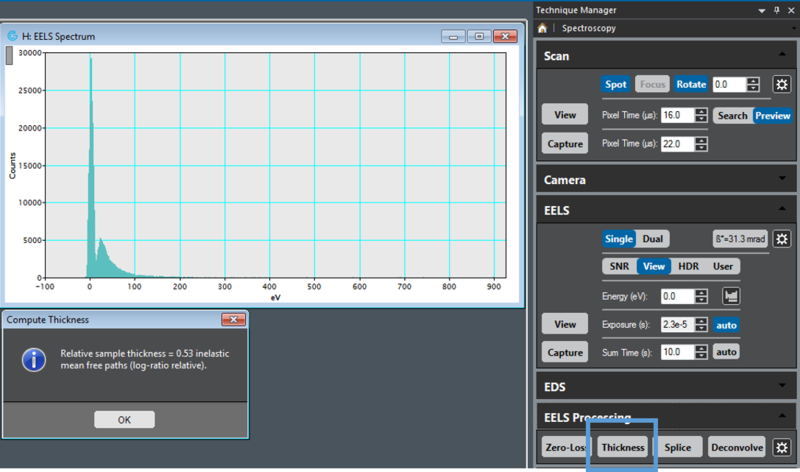 Choose among the four EELS detector settings (SNR, View, HDR, User) as needed for the experiment. Note: View and Capture use the same camera settings.